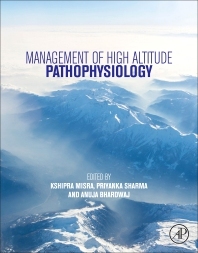 Management of High Altitude Pathophysiology presents a comprehensive overview on the various therapeutic practices and ongoing research relating to the development of more potent and novel formulations for managing high altitude pathophysiology. It provides a detailed application of both herbal and non-herbal therapeutic agents, including their nanoformulations. This important reference provides benefits to the medical and herbal scientific communities, doctors treating patients with high altitude complications, individuals travelling to high altitudes for recreation or work, and scientists working on future drug development. Dr. Kshipra Misra is an eminent scientist and worked as Additional Director/Scientist `F' at Defence Institute of Physiology and Allied Sciences (DIPAS), Delhi. There she headed Department of Biochemical Sciences. She obtained her Ph. D in Chemistry and was Post-Doctoral fellow at Harvard School of Public Health, Harvard University, USA. She is also visiting scientist in the University of Quebec, Canada. She has been constantly guiding M. Sc/ M. Tech and Ph. D students. She has successfully completed various projects in DRDO. She is expert member in various research project evaluation committees of different government organizations and academic institutes. She has authored more than hundred research papers published in international and national journals and has wrote book chapters also. She has two national and two international patents to her credit on the process and device for the arsenic remediation. She has also filed four patents on herbal preparations. She is life member for number of national and international professional societies. She has delivered number of invited talks in national and international events in India as well as abroad. She is in the editorial board of some of the journals of international repute and also reviewer for many journals. Among various awards, she has received WATI (Women and Technological Innovation) award from Bhartiya Stree Shakti in the year 2004, Anveshan Award-2003 by IIM, Ahmedabad for the innovative technology and Eminent Scientist of the year 2009 by National Environmental Science Academy (NESA) for her outstanding contribution in reducing the impact of Arsenic Poisoning of ground water in India by virtue of developing and implementing a simple and cost effective arsenic remediation technology. Her technology for arsenic remediation has been awarded DRDO- Spin off award-2007. She is also the recipient of prestigious Bharat Jyoti Award-2012 and NRDC, government of India social innovation award- 2012. Dr. Sharma has more than thirteen years of research experience working in the Biochemistry Division of DIPAS (DRDO). She has been working on the projects related to the improvement of performance of Indian soldiers deployed in the harshest of climates. Whereas the performance in defence operations demands highest from the human, extreme environment in military operations limits this performance. Her major research contribution is evaluation of anti-stress and adaptogenic activity of various herbal agents for development of adaptogens/nutraceuticals for performance enhancement. Dr. Bhardwaj is Ph.D in Life sciences and has worked under the supervision of Dr. Kshipra Misra, at Defence Institute of Physiology and Allied Sciences (DIPAS), DRDO, India. Her thesis work was on "Bio-guided fractionation of Ganoderma lucidum". She has post-graduate degree in the discipline of biotechnology and is graduate in the Medical laboratory technology. She has been awarded CSIR-fellowship in Life sciences. Her research work included extraction procedures, characterization of herbal extracts and/or fractions for the presence of bioactive principles. She has also carried out in vitro and in vivo studies designed to evaluate the bio-efficacy of herbal extracts. She has developed various skills in the subject of phytochemistry and herbal medicine during her tenure at DIPAS. She is also well acquainted with techniques in the field of pathology. She has presented and published research papers at both international and national levels and has also contributed book chapters.